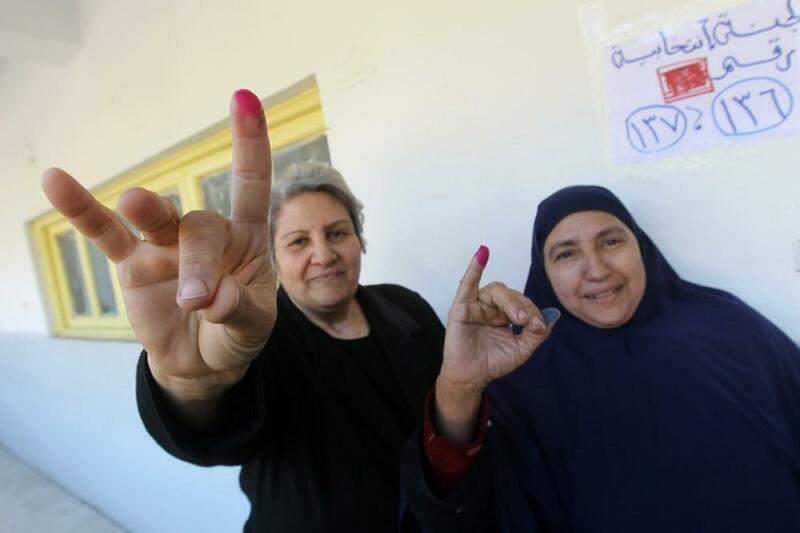 Egyptian women show their ink-stained fingers after voting at a polling station earlier this month. According to the election results, less than 2 percent of parliamentarians will be female. The final results for Egypt's parliamentary elections are in, and while there are no surprises, the Muslim Brotherhood exceeded expectations by capturing 47 percent of the vote. The final election results were read out Saturday with little ceremony, but the final tally cemented what most people in Egypt already know: Islamist groups are the new political powerhouse in post-revolutionary Egypt. Out of the almost 28 million people who voted in these elections, almost half cast their ballots for the Muslim Brotherhood's Freedom and Justice Party, the FJP. That's a staggering victory for a group that was oppressed and marginalized under former leader Hosni Mubarak. Coming in second, with a quarter of the seats, was Al Nour, the new party representing Salafis — hardline Islamists who believe in the segregation of sexes in public life. Altogether, that means Islamists will control a whopping 70 percent of Egypt's parliament. Coming in third was WAFD, a nationalist party founded in the aftermath of World War I. Many people discounted its electoral power, but it did relatively well, considering. New parties formed after Egypt's revolution fared badly; the Egyptian Bloc, representing a union of secular liberal groups, came in fourth. Because no quota system was put in place, women will also have little representation in the lower house of parliament, something that has outraged female activists. Less than 2 percent of parliamentarians will be female. Whether Islamist groups will band together to push through a conservative agenda is still unclear. The Muslim Brotherhood and the Salafis are rivals, but they've already reached an initial power-sharing agreement over who will become the new speaker of parliament. As the new kings of the political scene, the FJP has promised to reach out to all the parties. The biggest confrontation, however, may not be between the parties but rather between the ruling military junta and the newly empowered groups in Egypt. It's not yet clear what authority the parliament will have, and there are indications the generals running the country won't cede control easily. The new parliament is expected to convene on Monday. Saturday's announcement of the election results comes nearly a year after Egypt's revolution began. Protests ultimately toppled Mubarak, and more country-wide protests are expected to mark the anniversary Wednesday. The final results for Egypt's parliamentary elections are in. And while there are no surprises, the Muslim Brotherhood exceeded expectations by winning 47 percent of the vote. Another hard-line Islamist party, Nour, came in second, with moderate groups trailing far behind. NPR's Lourdes Garcia-Navarro reports. LOURDES GARCIA-NAVARRO, BYLINE: The final election results were read out today with little ceremony, but the tally cemented what most people here already know - Islamists groups are the new political powerhouse in post-revolutionary Egypt. Out of the almost 28 million people who voted in these elections, almost half cast their ballots for the Muslim Brotherhood's Freedom and Justice Party. That's a staggering victory for a group that was oppressed and marginalized under former leader Hosni Mubarak. Coming in second with a quarter of the seats is Nour, the new party representing Salafis, hard-line Islamists who believe in the segregation of the sexes in public life. That means Islamists will control a whopping 70 percent of Egypt's lower house of parliament. Coming in third is WAFD, a nationalist party founded in the aftermath of World War I. Many people discounted its electoral clout, but it did relatively well, considering. New parties formed after Egypt's revolution fared badly. The Egyptian Bloc representing a union of secular liberal groups came in fourth. Because no quota system was put in place, women will also have little representation in the lower house of parliament, something that has outraged women's activists here because less than 2 percent of parliamentarians will be female. Whether Islamist groups will band together to push through a conservative agenda is still unclear. The Muslim Brotherhood and the Salafis are rivals and not natural bedfellows. But they did already reach an initial power-sharing agreement over who will become the new speaker of parliament. The Muslim Brotherhood's FJP, as the new kings of the political scene, have promised, though, to reach out to all the different parties. But the biggest confrontation may not be between the parties at all but rather between the ruling military junta and the newly empowered groups here. It's not yet clear what authority the parliament will have, and there are indications that the generals running this country won't cede control easily. The new parliament is expected to convene on Monday. Wednesday marks the one-year anniversary of the beginning of the revolution that ultimately toppled Mubarak, and countrywide protests are expected. Lourdes Garcia-Navarro, NPR News, Cairo.